Synopsis: This morning, Kady thought breaking up with Ezra was the hardest thing she’d have to do. This afternoon, her planet was invaded. The year is 2575, and two rival megacorporations are at war over a planet that’s little more than an ice-covered speck at the edge of the universe. Too bad nobody thought to warn the people living on it. With enemy fire raining down on them, Kady and Ezra—who are barely even talking to each other—are forced to fight their way onto one of the evacuating fleet, with an enemy warship in hot pursuit. But their problems are just getting started. A deadly plague has broken out and is mutating, with terrifying results; the fleet’s AI, which should be protecting them, may actually be their enemy; and nobody in charge will say what’s really going on. As Kady hacks into a tangled web of data to find the truth, it’s clear only one person can help her bring it all to light: the ex-boyfriend she swore she’d never speak to again. 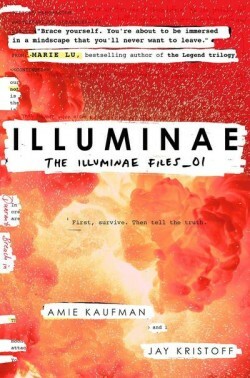 Part zombie-apocalypse, part sci-fi, the most obvious difference about Illuminae is the way it’s been told – in a found-footage style dossier, taken from various sources such as chat transcripts, camera feeds, diaries and artificial-intelligence data streams. It’s beautifully presented – each page designed to look like the document that’s printed on it – and there are plenty of Easter eggs if you know what you’re looking for (find as many YA authors as you can!). This storytelling style will become the most talked about part of the novel, I suspect – yet whether a found-footage narrative works over a “traditional” narrative is somewhat open ended: and will depend upon personal taste. There were times I felt it got in the way, when all I wanted was a cohesive, uninterrupted narrative. At others I was completely taken away by the interlocking documents. Against the vastness of space, the story that takes place upon the three ships is claustrophobic. Trapped in giant tin cans, and months and months from any civilisation, Illuminae is small in its scope, focussing on the survival of three ships carrying refugees from an abandoned planet as they try to avoid being irradiated by the a pursuing dreadnought’s nukes. Things get worse when an out-of-control virus threatens the safety of all the survivors and AIDAN, the on-board artificial intelligence, decides to friendly-fire. It’s all a bit of a mess, and it looks like Katy Grant is the only one who can save the remaining survivors…even if it means her demise. The story is intense, particularly as it ratchets towards its eventual conclusions. And whilst the last “chapter” feels a little too saccharine, authors Kaufman and Kristoff take no prisoners when it comes to merciless treatment of characters. World-building is equally compelling; the story doesn’t drown underneath sci-fi jargon, but it retains a sense of richness and reality and rarely, if ever, feels “made up”. Enjoyment of Illuminae will depend heavily on whether you enjoy the “found-footage” style of the narrative or not. Whilst jarring at first, it quickly becomes intuitive, though the details do sometimes get in the way. Unlike many sci-fi novels, its contained story also allows it to remain focussed, and world-building, whilst excellent, never threatens to overrun the novel. Coupled with a strong and extremely compelling story, Illuminae will quickly have you hypnotised and hoping for a continuation.